There are now two locations. Ever since Ann and Jonathan moved to the other side of north London, I’ve gotten to know Islington better and better. 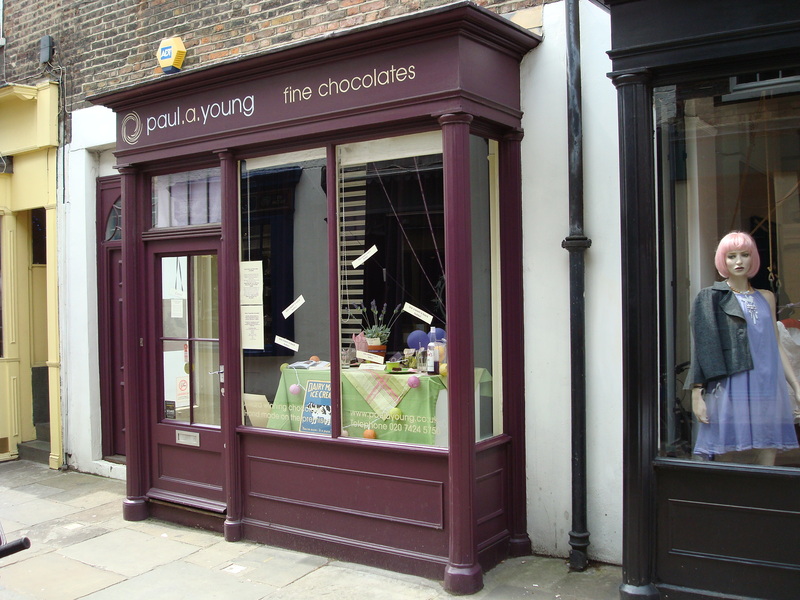 One store that I insist on returning to each time I pass through is this little treasure box of chocolates, located on a cobblestone pedestrian side street off of Upper Street. The hours the store stays open are frustratingly few, but well worth the accommodation of my schedule. Chocolates spiced with all sorts of strange flavors — chilies, cinnamon, lime, salt, lavender, ginger, to name a few — sit in neat little piles on pedestals placed around the cream-colored shop. They don’t offer as many samples as I would like, but I’m willing to take a chance on some of the options, like saffron and honey. According to the website, a shop has recently opened up in the east end. Since most visitors to London tend not to make the effort to find Islington, the shop in the City is worth the effort to find.